Learn to use STAMPtk with PDFtk to add headers, footers, watermarks and stamps to PDF documents. These command-line tools are ideal for server-side processing of PDFs. 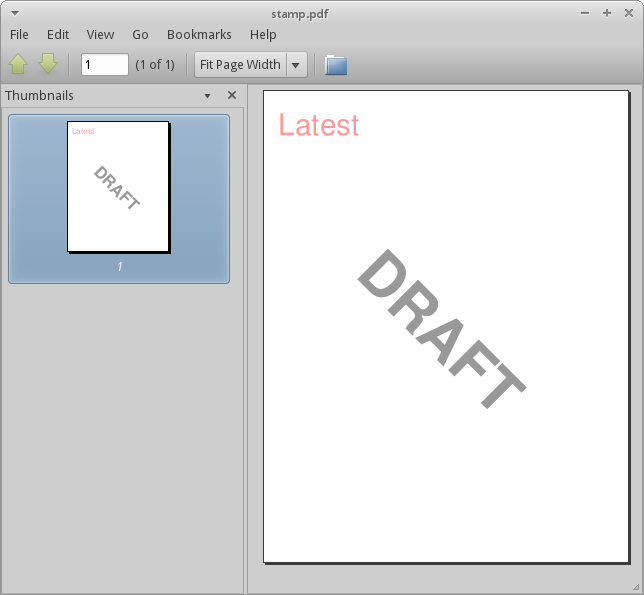 PDF preserves the design and formatting of a document. However, its pages are difficult to edit. This becomes a problem when you want to add new information to a PDF page. For example, if you have a web server and want to add a timestamp or user information to a PDF as it is served to the user. Or if you have a web-based document management system that requires downloaded PDFs to be watermarked "DRAFT". Or maybe when visitors download sample documents you want to add invisible text to the front page to help you track that document. Then this guide is for you! Will these instructions also work for manipulating local PDFs? Yes. STAMPtk and PDFtk are both available for Windows and Mac OS X as well as Linux. They are both command-line tools, so they are better suited for use by power-users and developers. 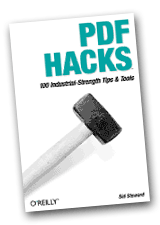 PDFtk Server is free (as in freedom) software that you can use to manipulate PDF documents. You can download free installers for Windows and Mac OS X from our site. Most Linux distributions maintain a "pdftk" binary package you can install. 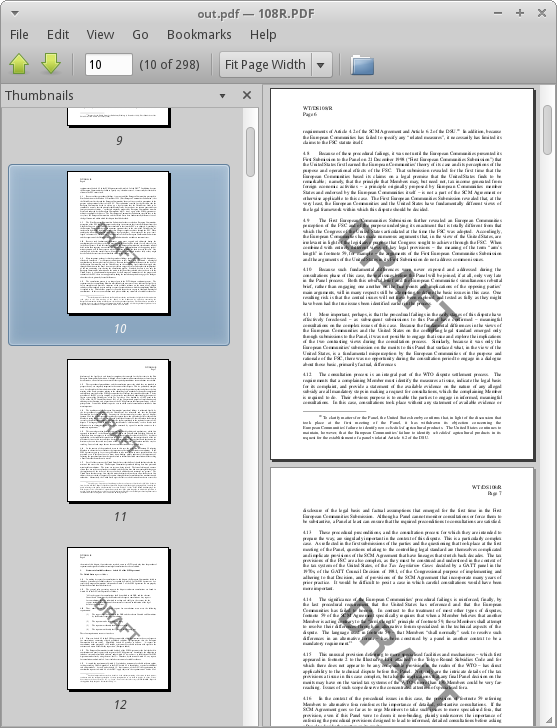 Using PDFtk, you can overlay one PDF’s pages on top of another PDF so they look superimposed. This operation is called multistamp. The stamp PDF can have one or more pages. If it has multiple pages, then each stamp page is applied to each page of the target PDF in order. If the target PDF has more pages than the stamp PDF, then the final stamp page is repeated over the remaining target PDF pages. If stamp.pdf is a single page, then it will be applied to every page in in.pdf to create out.pdf. If stamp.pdf has five pages and in.pdf has ten pages, then the first five pages of stamp.pdf will be applied in order to the first five pages of in.pdf. Then page five of stamp.pdf will be applied to the remaining pages (6-10) of in.pdf. If you don’t want the final stamp page repeated over the rest of the document, just append a blank page to the end of your stamp PDF. So, you already have in.pdf. How can you make the perfect stamp.pdf? Read on, friend. 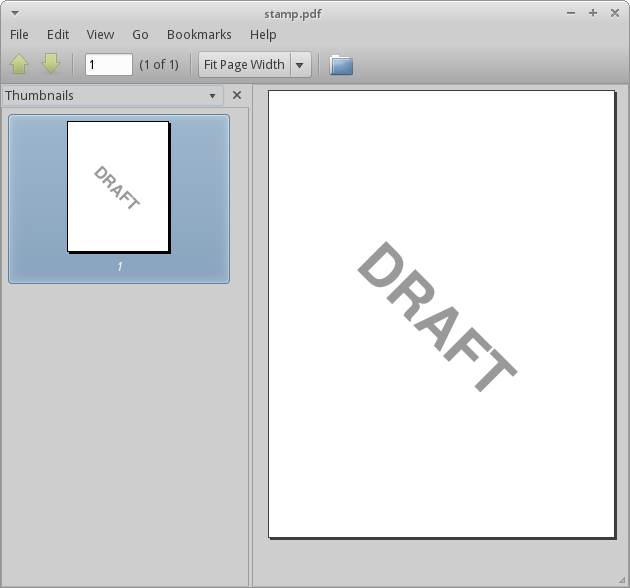 STAMPtk is a fast tool for creating basic PDF pages and documents. It is perfect for making the stamp.pdf PDF in the example, above. It is commercial software that comes with support and a 30-day satisfaction guarantee. We don’t offer a trial version, but if it doesn’t do the job then we’ll refund your purchase. Its manual explains all of its features in detail. Let’s look at some examples to get an idea of what is possible. I should note that the alpha option is applied to all text in STAMPtk’s output PDF. If the STAMPtk command line starts getting too long, consider using its include option that can take page options (one per line) from a file or stdin. What else can you do with STAMPtk? STAMPtk’s default page size is Letter (8.5" x 11"). If you want an A4-sized page, use the media option like this: AAmedia=A4. To make the media landscape, append Landscape, e.g. AAmedia=A4Landscape. You can position text on the page using relative coordinates (left, right, center, top or bottom) or using absolute coordinates. You’ll probably want to set the text’s origin, which is used to position the text. For example, the default text origin in center,center, which is handy for centering text on the page like we did in the first example. In the second example, we used the text origin of left,top for "Latest" because we wanted it to fit nicely in the left,top position of the page. In our next example, we will use these relative coordinates to make a document header and footer. Since STAMPtk knows the media size, it can accurately position the text using relative terms. You can control how close to the edge it goes by setting the margin option (e.g. CCmargin=40). STAMPtk’s units are points. There are 72 points to an inch. When using absolute coordinates to position text, the page origin is in the bottom-left corner of the media. Increasing X moves text to the right. Increasing Y moves text up. Subject to the terms of its license, one STAMPtk Server License allows you to install and run STAMPtk on ONE production server and THREE development computers. It includes support, but does not allow distribution. It also comes with a 30-day satisfaction guarantee. If it doesn’t fit your needs, we will refund your purchase. The price for one license is $95. STAMPtk is available for 64-bit Linux, 32-bit Linux, Windows, Mac OS X and other platforms. Contact Us to Purchase STAMPtk!